The Maple Leafs are 7-3-0 to start the season, and the city can barely contain its excitement. This team is for real and Toronto knows it. Two quick goals and it’s evident the 38-year-old Patrick Marleau fits right in with the young guys. Since then, Marleau’s netted two more pucks and added three assists for a total seven points. Marleau came to Toronto to win the Stanley Cup, and his personal expectations are high. The Leafs are off to an incredible start, so maybe it’s time to start planning that parade after all. This victory was Toronto’s first in Montreal since October 1, 2013, and the team’s fourth to start the season. The Habs are also the second worst team in the league right now, which is just another reason for Leafs fans to celebrate. The Chicago Blackhawks have won three Stanley Cups since 2010, but Auston Matthews wasn’t fazed. Following his heroics, the Leafs were a perfect 3-0-0 to start the season. This begs the question, are the Blackhawks still struggling since being swept in round one last season, or are the Leafs just that good? The Leafs are notorious for blowing leads and losing, but this wasn’t the case against the New York Rangers on October 7. After blowing a 5-1 lead, the Leafs scored three in the third to win the game. Here’s the referee’s view of Nazem Kadri’s goal, Toronto’s seventh and final goal scorer of the night. By this point in the season Toronto had 15 goals in two games, while Montreal has a mere 18 goals so far. 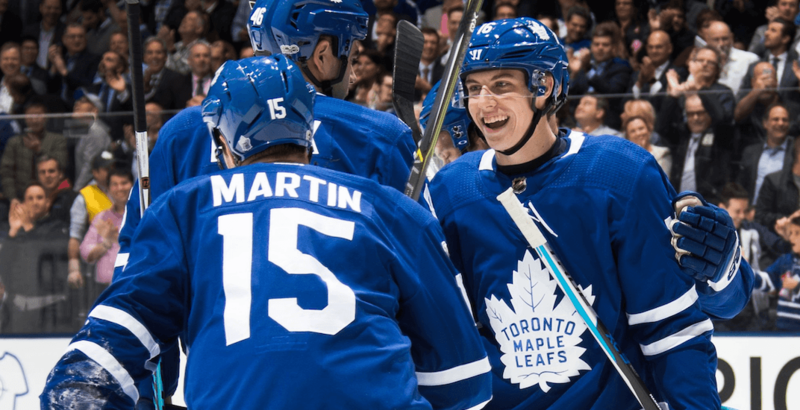 Mitch Marner’s fourth line “demotion” is hardly that, and he proved it Monday night by tallying two assists. He’s also formed a bromance with Matt Martin, and seems perfectly happy and productive in his current role. The kid’s a star, so just leave him alone. Alex Ovechkin may have 10 goals in 10 games, but he wasn’t able to beat Frederik Andersen on Oct. 17. Andersen made 30 saves in the win… who says the Leafs can’t play defence? As it currently stands, the Leafs have the fifth best penalty kill and the third best power play in the league. And they’ve been dominant since the first game. James van Riemsdyk already has five power play points to start the year, one of which forced Toronto’s first OT win of the season. Now that’s how you win hockey games. The Leafs defenceman has nine points to start the year (one goal eight assists), and many of his helpers look like this. As one of four defenceman playing over 20 minutes each night, it’s evident Mike Babcock has faith in his young blue liner. Could he be Toronto’s next captain? Brought in as a fourth line centre, it’s amazing Dominic Moore has three goals in six games to start the season. He scored his first goal three and a half minutes into his first game back with the Maple Leafs, and has since secured the job from forward Eric Fehr. Maybe he should just play with Matthews on line one? This rarely happens in today’s NHL, and the Leafs would eventually land their sixth win of the season because of it. It’s a rout… 4-1 Leafs on five shots. 16.5 minutes into the game. Yikes. Curtis McElhinney also picked up the win, giving Andersen (who had five wins in six games at this point) a well deserved break. Its always nice when your backup can deliver. Ryerson journalism graduate and occasional teacher with the Toronto District School Board.